Ferns are beautiful, grown in the garden or in the house. Their light, airy greenery creates a special mood. However, their growth requirements are often rather specific, and many gardeners would like to have that ferny effect in areas more suitable to other plants. Fortunately, there are a variety of small-leaved climbing plants that have a fern-like appearance. Often, their curling tendrils add to the look. A tendril is a modified form of a stem or petiole or, most often, a shoot. Usually it is thin and elongated. Tendrils are used by plants to lift themselves higher, toward the sun, usually by clinging to some support. Some tendrils even have adhesive tips. Ordinarily, tendrils cannot bear a lot of weight. Tendrils are thigmotropic, which means that in the early period of their growth they are sensitive to touch. When a young tendril touches something, cell growth on the side away from the support increases rapidly, so that tendril curves. As growth continues, it spirals around the support, looking rather like a spring. Many climbing plants grown in the garden have a light, frothy, appearance and can be placed where a fern-like look is desired. For example, Clematis, climbing plants in the Ranunculaceae family, climb by means of tendrils. Some species, such as C. lasiantha, have many small leaves and present a fern-like appearance from a distance. The common name of this clematis is virgin’s bower. Another “ferny” climber is Amphilophium paniculatum. Often a lightweight, ferny appearance is desirable in a houseplant, even in locations where ferns do not grow well. Once good choice is grape ivy, Cissus rhombifolia, which not only uses tendrils to climb but also to link stems together, forming thickly leaved mats or clumps. The appearance is quite ferny. This is a popular house plant. One fern genus, Lygodium, contains about 40 species of climbing ferns. In this genus, the rib in the middle of each front is unusually thin and flexible, so each frond twines around a supporting structure. 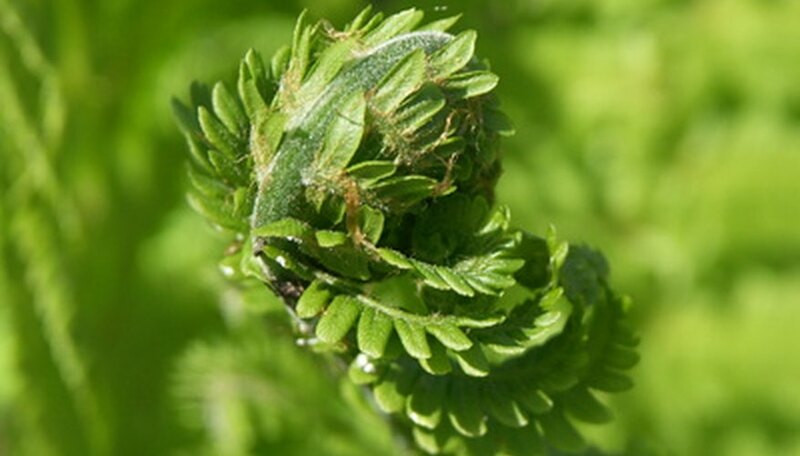 The fronds can be up to 12 yards long, depending on the species. Most of these ferns are native to tropical regions, but a few are also found in temperate areas. Lygodium palmatum, the Hartford fern, is native to the eastern United States. It is now quite rare.